Do you have a jewelry store or other retail location that stocks and sells a wide selection of earrings? Our elegant, understated earring stands and holders allow the jewelry itself to hold the spotlight, drawing out the colors and textures of the piece free of distration and clutter. 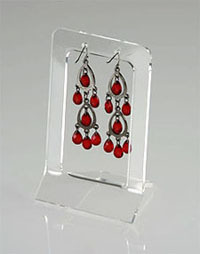 Made in the US from sturdy, high-quality polished clear acrylic, our earring holders offer a beautiful and very affordable solution for organizing and displaying your jewelry. Most are in stock and ready for immediate shipment.